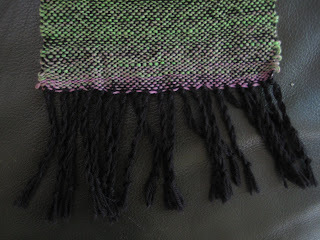 The reason I bought the loom was to use some of my handspun. I bought some merino bamboo fiber (Meribo) from Purlescence yarns at Stitches, and some carbonized bamboo fiber from MC Mercantile on Etsy. The merino blend is on the right - it came out with a lovely shiny finish and a nice marled effect. The carbonized bamboo was very soft but I didn't enjoy spinning it as much - it was rather sticky. It also made a very matte single. I spun each of these as a fine single and plied them together. I was pleased that the merino mix retained it's shine and the yarn was very soft. I warped the loom with a Habu laceweight in 100% bamboo. It is colour 3 which is a very deep purple. I made sure to use paper between the layers of the warp as the yarn was so fine. It was harder to warp than the sock yarn I had previously used and I did have to make some adjustments for tension. I wove about 6.5' and cut off the warp. I tied the warps in groups of six to make tassels. 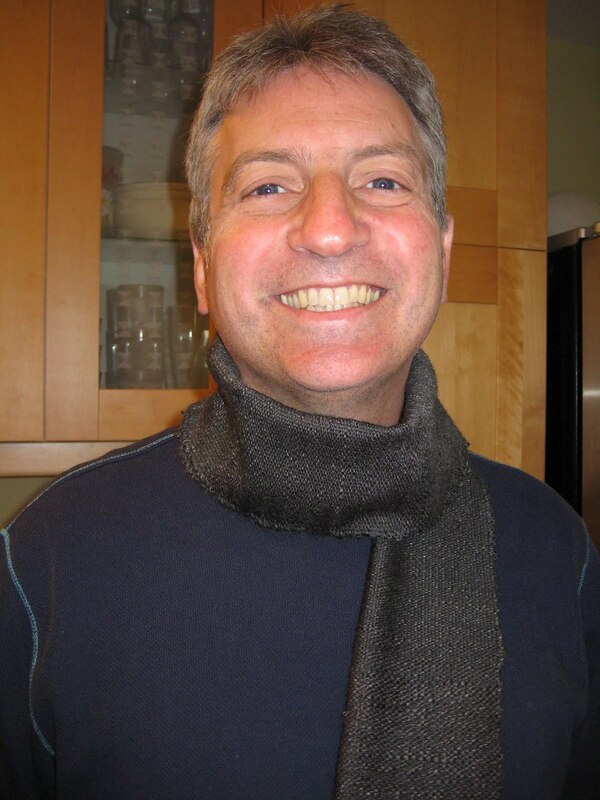 Nigel seems pretty pleased with his new scarf. 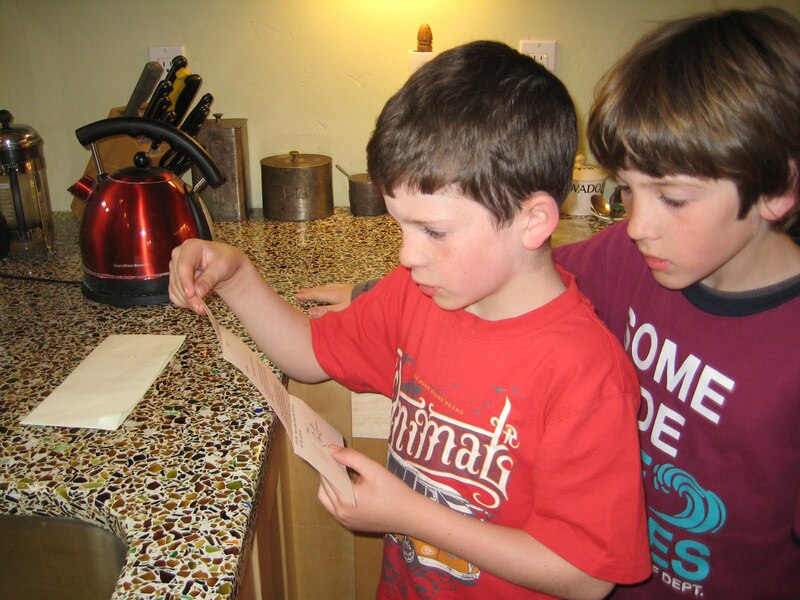 I did a lot of spinning over the weekend with much attention from Fin. He kept asking to "have a go" but as I was in the middle of a project I could not really let him and fobbed him off with "when I've finished spinning this yarn". On his arrival home from school he immediately cornered me, demanded the status of my spinning project, and insisted it was his turn to use the wheel. 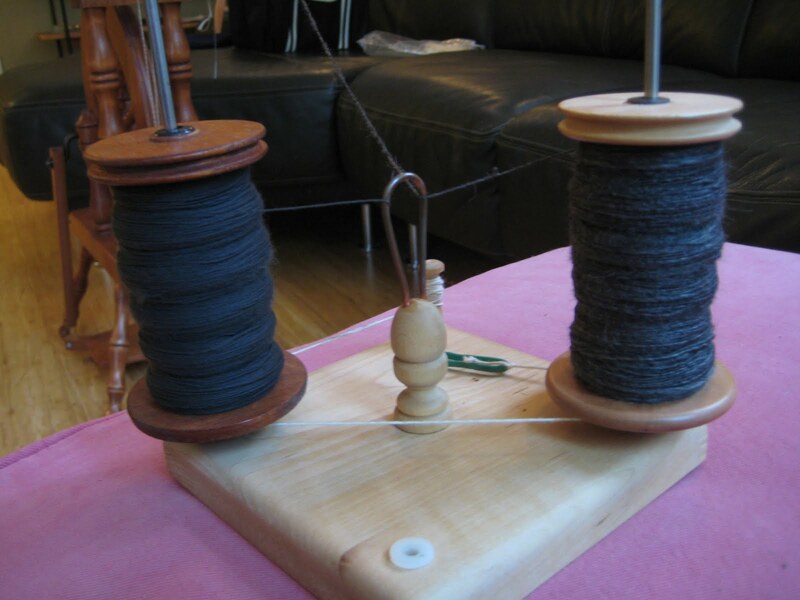 We sat down with some fiber and I started to teach him the rudiments of spinning. After a few minutes he announced "it is harder than it looks"! (As I discovered on my first attempt at spinning with Christina). He did persist and wanted me to wind his yarn off on the niddy-noddy (he liked that name) and make him a little skein. Now he wants me to teach him to knit! 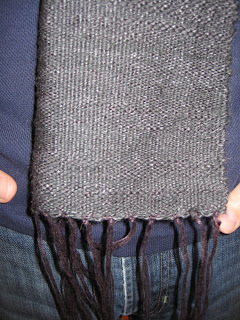 I finished my first woven item. This is a scarf for Lamar. 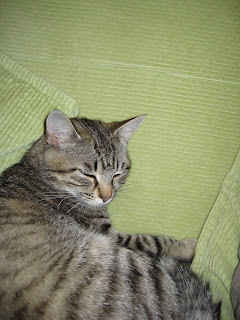 I discovered that this sort of plain weaving is called "Tabby". I used wildfoote sock yarn in black for the warp and Noro Kureyon sock in colour S95 for the weft. 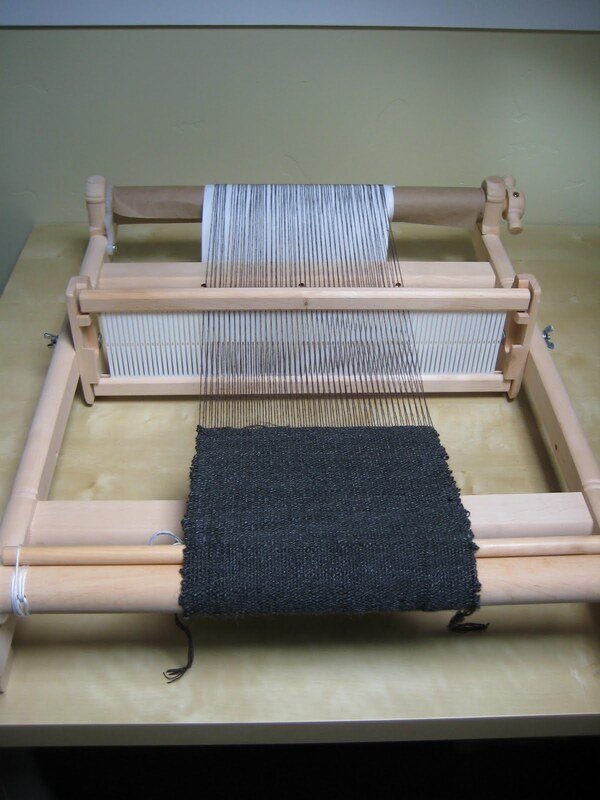 The warp and weft were pretty well balanced so the black colour is still quite visible. I warped about 7.5" wide before I ran out of yarn, the warp length is about 7' - the finished scarf about 5' after wastage. My weaving pulled the width in to about 7". I used about 75% of the Kureyon sock. 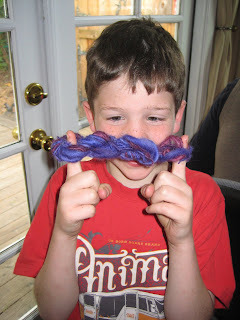 I did cut out the most lurid pink colours from the yarn because it's intended recipient is male. I also did a twisted fringe for a more masculine look. I learned a lot about weaving with this project - the first thing is that it never occurred to me that as I wound the shuttle I would be reversing the colour transitions. 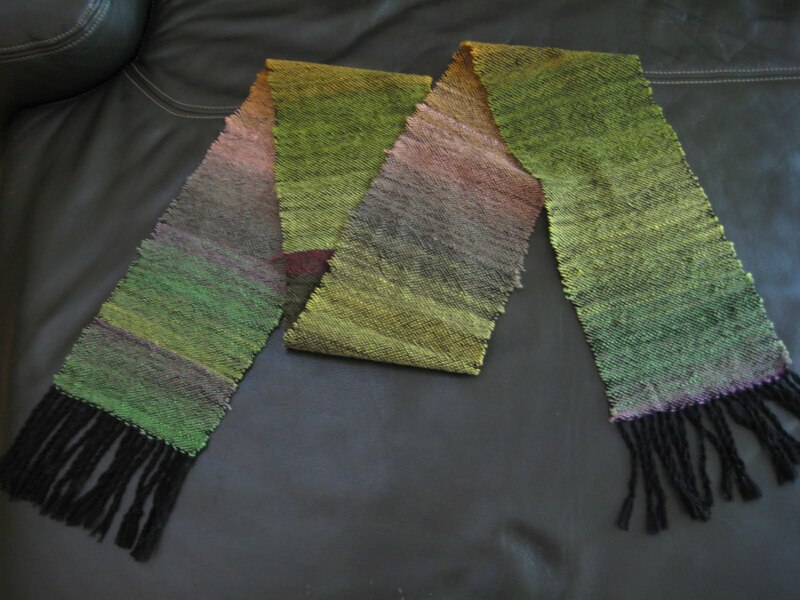 In this scarf it's OK to have a more stripey look - but I had imagined preserving the Noro transitions in which case I would have to wind off sections of the yarn before winding onto the shuttle. I also improved my weaving technique as the project progressed. I have Davenports "Hands On Rigid Heddle Weaving" book which has some useful tips which I tried to follow. The main area that could do with improvement is my selvedges which are not too neat - but, as I discovered, it's harder than it looks to keep the edges even! A very special letter arrived at the house today. They both read it together. 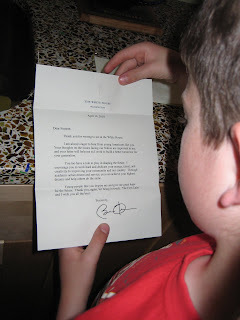 The letter was in response to a letter Fin wrote to President Obama with his views on the environment (please plant more trees). He was thrilled - lets hope he takes the advice to work had at school to heart! I have acquired a loom. Its a 16" Kromski Fiddle rigid heddle loom. My intention is to weave some of my handspun yarn. 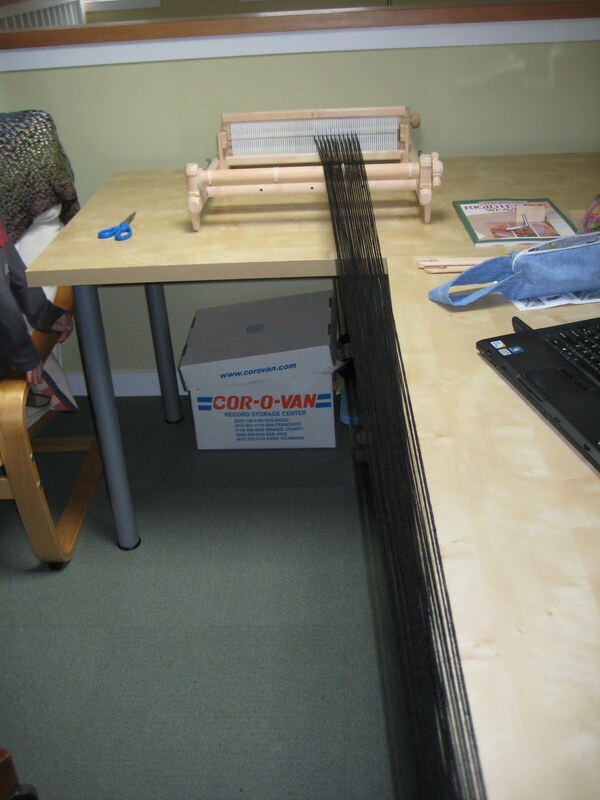 I am glad I chose the 16" - the weaving area is 15.5", but the loom itself is just over 20" wide. I would not have had space for a wider loom. It came with a 10 dent heddle and so for practice I decided to start weaving with some sock yarn. 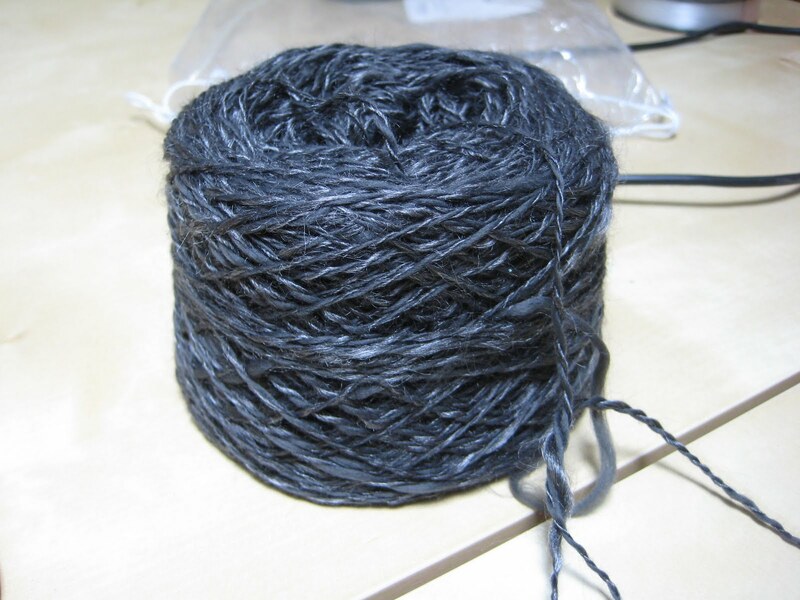 I used a left-over partial ball of Wildfoote sock in black to warp. 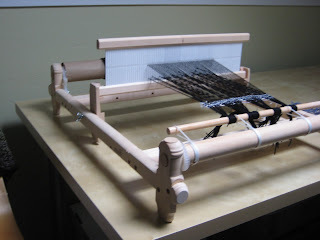 I had read a book on weaving with a Rigid Heddle loom and was quite daunted by the explanation of warping with a warping board. The Fiddle is drilled for use as a warping board but I didn't have any suitable dowels to use as pegs so I did some searching on the Internet and discovered the concept of Direct Warping. Since I'm unlikely to need to weave anything longer than 6-7' I think direct warping will fit my needs. I set up the warp from one end of my desk to the other - which created about a 6' warp. The warping process took me about an hour or so and then I was off with the weaving! I used Noro Kureyon Sock as the weft yarn - cutting out the most lurid pink colour once I decided that I would weave this for a friend who was hospitalized last week. I was impressed by how easy it was to get started - I completed the weaving in a week - photo of finished item to come. 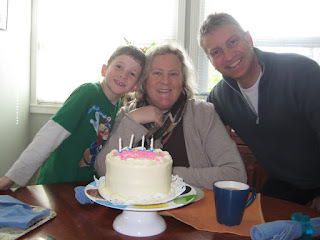 I celebrated a birthday last week; 29 again of course. I had the day off work and messed about all day with no particular agenda - it was lovely! I spun the rest of the meriboo fiber and listened to the radio, read my book, and of course, ate cake! 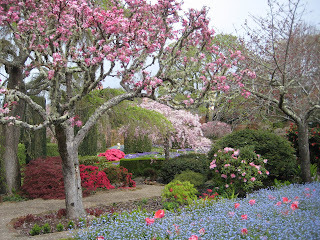 On Friday I went with Fin's class to Filoli Mansion. The name is derived from the original owner's motto: "Fight for a just cause; Love your fellow man; Live a good life." 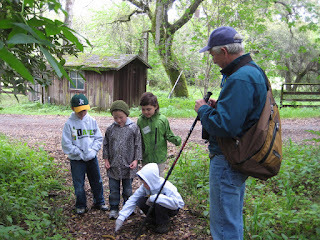 The class had a nature hike, each small group with a docent. Fortunately the rain held off until after our walk - then it chucked it down! Charlotte arrived in our home this weekend. She came from the Santa Cruz Animal Shelter. Adam and I went over there to meet with some cats and choose one - after 5 minutes Adam announced "she is my cat"... and she is. 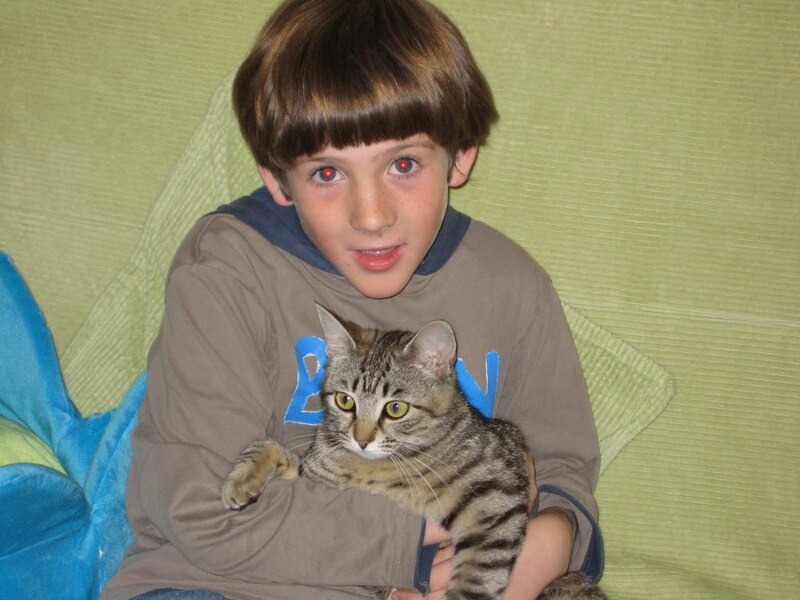 Her name was Charlotte in the shelter, and Adam felt it suited her. He has naming rights for this cat so Charlotte it is. (Adam tells me that her middle name is Sydney!). She is a delightful little cat - about 2 years old. She loves to play but she also really seems to like to sit quietly on your lap and purr really loudly. 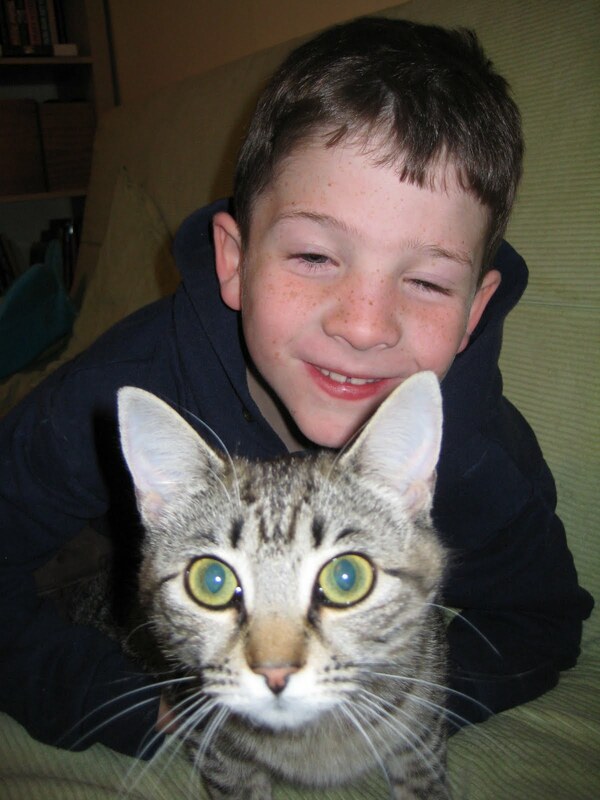 We have not had a cat in the house for 4 years or so, since Tiddles, and it's really nice to have an animal about. She has already eaten, and used the litter box, and also started to explore the house. She also spends quite a lot of time watching out of the window - so I'm guessing she was once an outside cat. It's odd, again, to know nothing about our cat's past life - she had only been in the shelter 10 days or so, and they picked her up in Ben Lomond. If you are looking for a pet I can strongly recommend the Santa Cruz shelter - the folks there were all really helpful and made adopting our new pet a pleasant experience. (Also no long list of references, statements of future care for your cat etc). They had several really nice cats too - but none as nice as Charlotte.